Bay Nature does it again: a guide to car-free hiking throughout the Bay Area. Options are limited because there’s no reason to send a bus up Highway 9 or 35 in the Santa Cruz Mountains, for instance, and lots of buses that do pass parks run only on weekdays. It’s not long before we’re catching glimpses of the fiery sunset behind us. We pick up the pace and arrive at Wildcat campground via the BBQ Terrace Trail, set up our sleeping bags, and kick back to watch the blazing sky fade to twilight, with the crest of Diablo looming behind us. Early Saturday morning we tackle the summit trail. The previous day’s laid-back ascent turns into a heart-pumping climb. Within two miles we’ve gained 1,100 feet and are rewarded with breathtaking vistas, from Mount Tamalpais and the city in the west to the faint outline of the snowcapped Sierra Nevada in the east. We stop for a few photos and a snack before the brisk fall breeze encourages us to get moving. Without a parked car waiting for us back in Walnut Creek, we’re free to make our way down the north side, enjoying new trails and scenery…. I’ve been meaning to test the practicality of taking the light rail to Santa Teresa County Park. This map makes it look doable. You can also take the bus to within a casual stroll of a couple Almaden-Quicksilver trailheads. You can also do the entire Ohlone Wilderness Trail from Ohlone College to Del Valle Regional Park. If nothing else it’d thwart the industrious car window smashers on the Fremont side. Here’s a cool idea for an earnest, hard-working do-gooder: Set up a hike-and-bike shuttle from, say, Los Gatos to Saratoga Gap. 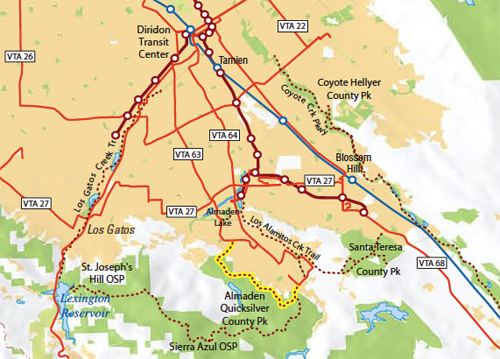 Another link: Transit & Trails, which will eventually cover all the ground in the Bay Nature article. Right now it’s just a placeholder. Gambolin’ Man sold his car two months ago and has been without! Options are public transit, friends’ cars, and CityCarShare….definitely a cheaper way to go, plus infinitely smaller carbon footprint…but as you can see, less frequent postings from afar! I ain’t done, though – more to come!